Karen Phillips: With over 15 years experience in graphite pencil drawing, Karen Phillips is a British professional wildlife artist. With over 15 years experience in graphite pencil drawing, Karen Phillips is a British professional wildlife artist. 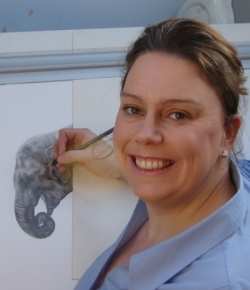 Self taught, her only formal art training was to GCSE level art where she experimented with a variety of different media, before finding her real passion for graphite pencil wildlife art. She showed an early talent for capturing the character and emotion of her subjects. After having her son, Karen decided to take the opportunity to explore and develop her artistic talents further. 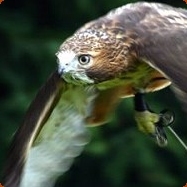 So here we are working as a small, family-run business based in rural Cheshire, England. 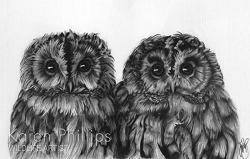 Many thanks to Karen Phillips, the Cheshire wildlife artist, for donating a beautiful signed print of a pair of Tawny Owls, Clicky & Titich and two sets of her magnificent greeting cards to sell in our small gift shop. The signed print will be auctioned to raise much needed funds for the sanctuary.